The city has replaced a more than 125-year-old pipe underneath Route 20 to avoid a sewer collapse. Sayegh said “countless” number of residents would have been affected. Residents in the area would have found their sewer backed up and motorist would have been cut off from the highway. “There would have been sewage in indeterminate number of homes,” said the mayor. “It could have resulted in sewer overflows going across the highway,” added municipal engineer Fred Margron. 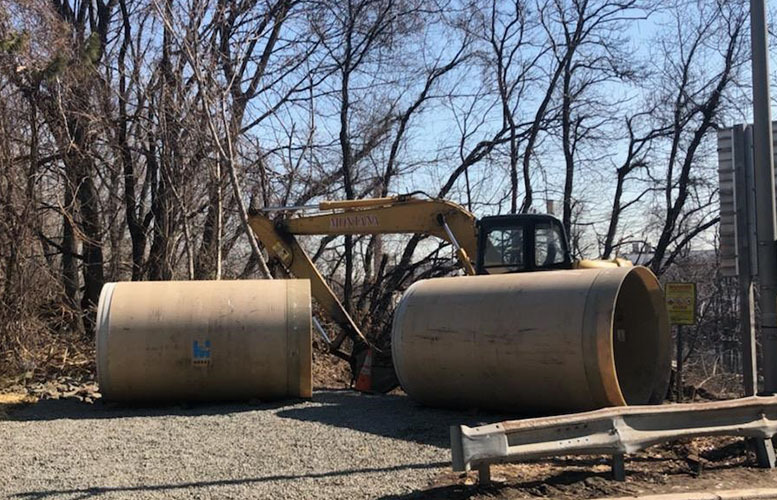 Municipal officials said the 400-foot, 8-foot diameter pipe ran underneath Route 20, starting from its juncture with Route 80 (Market Street exit). The pipe was originally installed in 1893, said Margron. Montana Construction of Lodi handled the work over a two-year period. The firm began work in late 2017 and completed most of the work this week. Replacing the pipe cost $460,000, said the mayor. Margron said the company has some minor work that remains like sealing joints and some grouting. “I’m glad our sewer operator caught the breaks that he did. It could have resulted in a major, major failure of our sewer system and road collapse. We were able to fix it without any interruptions,” said public works director William “Billy” Rodriguez. Lilisa Mimms, councilwoman at-large, who lives in the area, said she was happy to see the city caught the problem before it turned into a catastrophe. The replaced pipe will be good for the next 100 years, said the engineer.